“Oh hai, didn’t see you there Mr. Strangely Dressed Captain Guy. Buy hey since I’m here, I’m wondering if you could take a moment off from staring bravely into the distance and point me towards where the bathroom is on this boat. 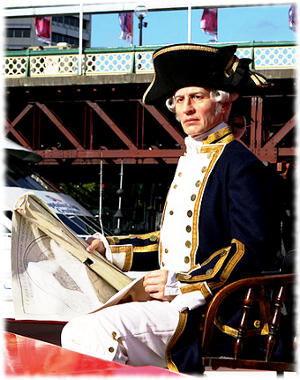 When I first saw this picture I thought this guy was part of one of those history boat tours where someone dresses up like a famous person of historical significance and pretends to be them the whole tour. You know, pointing out different landmarks and attractions while copping a fake accent and dropping in well-timed historical references. 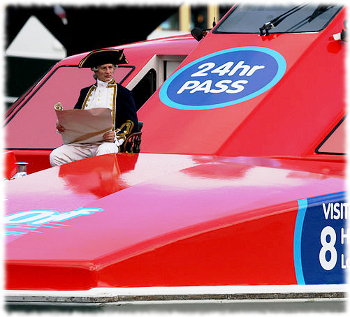 Turns out it is actually a wax figure of Captain James Cook that was brought out and given a boat ride to celebrate some events that were happening in Sydney, Australia. Specifically the opening of a new wax figure museum and the launching of a new boat for one of the cruise companies there. The tie in with Captain Cook is that during one of his famous voyages he observed a transit of Venus across the Sun which only happens once every couple hundred years …and that same transit of Venus was happening again around the time of the big events happening at the two businesses. Sooo, yeah. But really any excuse is a good excuse to do something as quirky as take a wax figure out for a boat ride. And if you ever find yourself on a boat in the waters by Sydney, Australia, keep an eye on the other boats. You never know when you might spot a waxy ghost from the past.